I recently had a hankering for a good ‘ol pot pie. Something savoury, filling and hot; nothing like those salty, frozen, single-serve types- which I’m pretty sure don’t come vegetarian anyway. I always thought you needed a pie crust to make one so I would shy away from the idea. 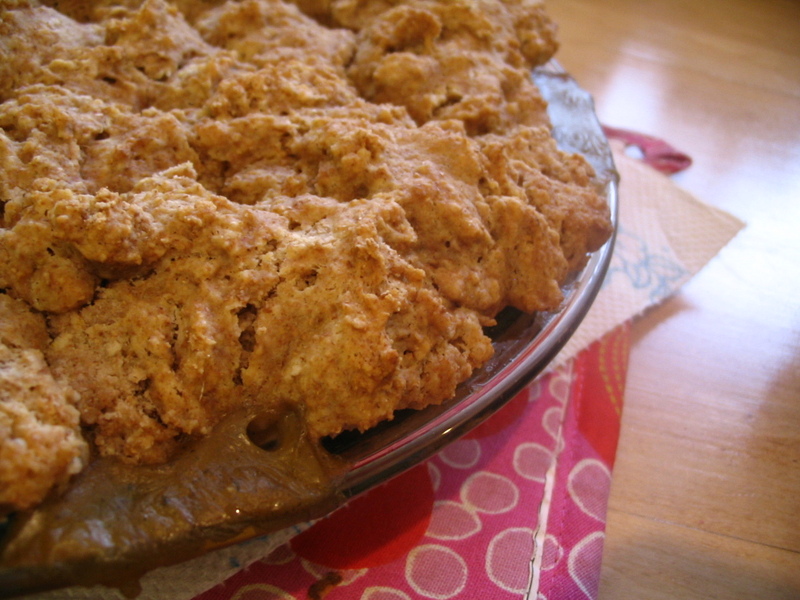 But then I looked around for some recipes, and many just had a biscuit-type crust on the top. Voila, how easy could that be?! Basically, you just fry your fave veggies, add a protein (I used green lentils as I think they take on ‘poultry’ type seasonings well), make a gravy and top it with your biscuit dough and pop it in the oven! Coupled with a fresh salad, you’re good to go! I had some left over brown rice in the fridge, so I added some of that too. Fry lightly for 3 minutes. Lower heat, stir and wait for your gravy to thicken. 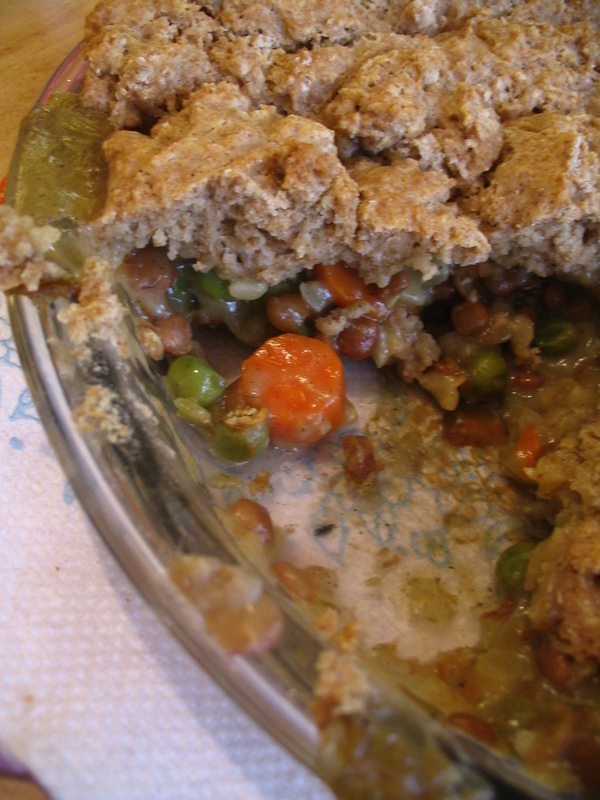 Once thickened, remove from heat and spoon into a pie dish. 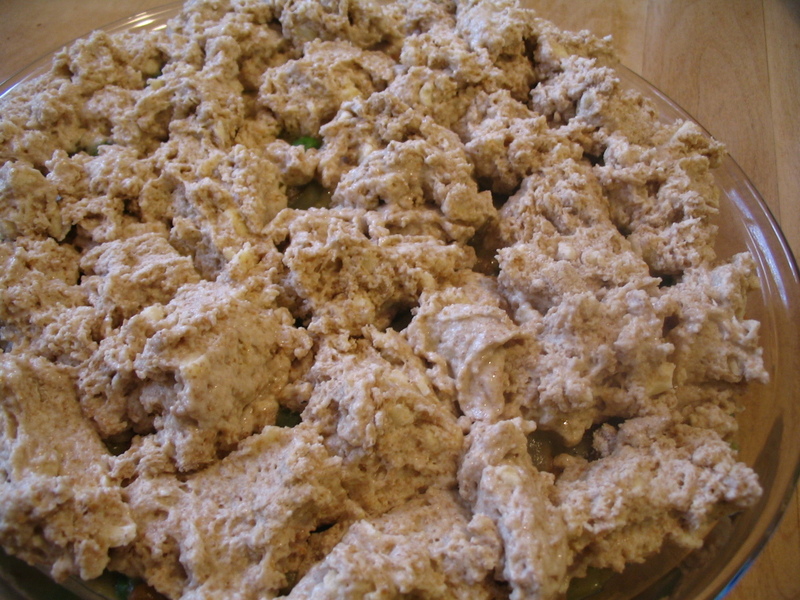 Drop walnut sized pieces on top the filling in pie dish so that pie is almost entirely covered. Place pie dish on a cookie sheet before putting in oven to prevent the filling possibly boiling over (I learned this one the hard way) and bake for 30-40 min until filling bubbles and dough is golden brown. 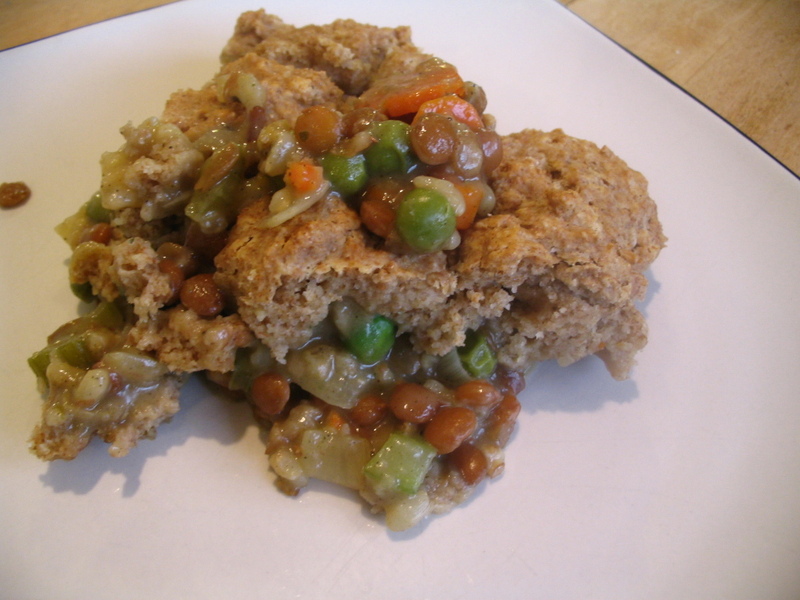 This entry was posted in Recipes and tagged lentils, pot pie, vegetarian by Ashley. Bookmark the permalink. Looks delicious Ashley! I love the idea of the biscuit topping…and the gravy. Yum. Au contraire, you *can* get single serving frozen veggie pot pies from Amy’s Kitchen. They used to sell for about $4 each, but I don’t buy them anymore as they’ve recently been jacked to $5-7 each everywhere I see them! They were good, but your homemade one looks 100 times better and cheaper!